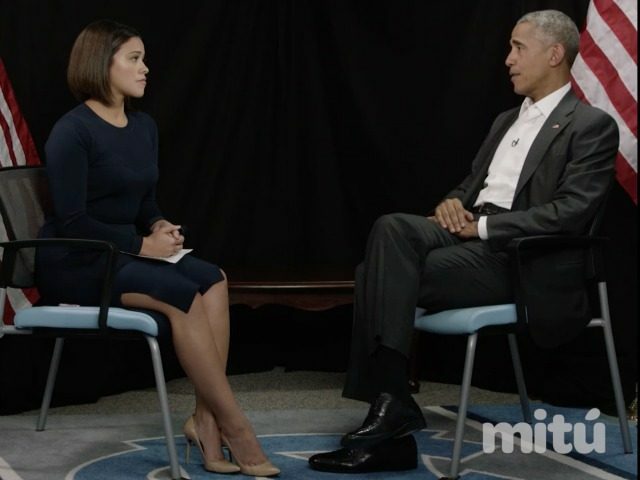 Rodriguez asked Obama whether “undocumented citizens” should vote, specifying that she calls illegal immigrants “citizens” because they contribute and work in the United States. RODRIGUEZ: Is the election rigged? OBAMA: No. Unfortunately, here in America, there is a tradition of making it hard for people to vote. You know, historically, it was done purposefully to prevent African-Americans from voting. And that tradition sometimes has carried over. But here’s the good news: even though people try to discourage you from voting, if you want to vote, and you show up at your polling place, they can’t stop you from voting. OBAMA: They can’t stop you from voting. If people want to know how to vote, then you can go to iwillvote.com. The fact of the matter is that we give our power away all the time. You know, we tell ourselves, “it’s hard, it’s not gonna matter, it’s not gonna count.” And the powers that be, they’re counting on us giving our power away. RODRIGUEZ: Many of the Millennials, DREAMers, undocumented citizens — and I call them “citizens” ’cause they contribute to this country — are fearful of voting. So if I vote, will immigration know where I live? Will they come for my family and deport us? OBAMA: And the reason is — first of all, when you vote, you are a citizen yourself, and there is not a situation where the voting rolls somehow are transferred over and people start investigating, et cetera. The sanctity of the vote is strictly confidential in terms of who you voted for. If you have a family member who maybe is undocumented, then you have an even greater reason to vote. RODRIGUEZ: This has been a huge fear presented, especially during this election. OBAMA: …Who may not have a voice. Who can’t legally vote. But they’re counting on you to make sure that you have the courage to make your voice heard.